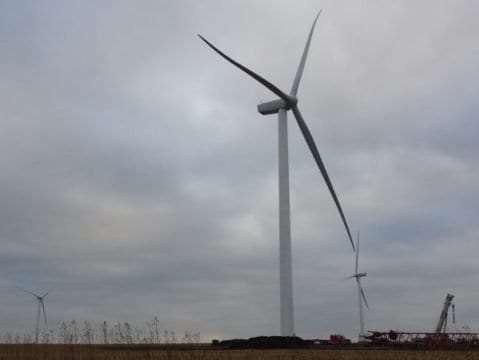 A Delaware County wind turbine project that was put on hold a couple years ago could happen after all. RPM Access is hoping to build wind turbines southwest of Manchester. The project is being revived due to a change in the proximity requirements between wind towers and eagles’ nests. This is the same company that built the 17 wind turbines in the Elk Wind project near Greeley. A RPM Access representative has told the Delaware County Board of Supervisors that if plans move forward, they expect the project southwest of Manchester to be even larger than the Greeley project (though an exact number of wind turbines won’t be determined until more data is gathered). RPM Access officials will once again reach out to prospective landowners about the project. At Monday’s County Supervisors meeting, the board approved a permit for the company to re-build a meteorological tower in the project’s prospective area southwest of Manchester on the Todd and Donna Boss property a couple miles south of Highway 20. The tower had been taken down about a year ago when it looked like the project wasn’t going to happen. The 200-foot tall meteorological tower will be used to test the potential for wind flow, gathering such data as wind velocity and temperature. The company hopes to put the meteorological tower up yet this month. If all goes as planned, the wind turbine project could happen as early as next year.